The Switch iterations of Pokemon continue to introduce new mechanics. With each passing day, Nintendo and The Pokemon Company reveal additional information about the upcoming Pokemon: Let's Go, Pikachu and Eevee games for Nintendo Switch. The latest information revolves around some pretty interesting topics: Legendary Pokemon, the games' GO Park, a new Candy system, and more. 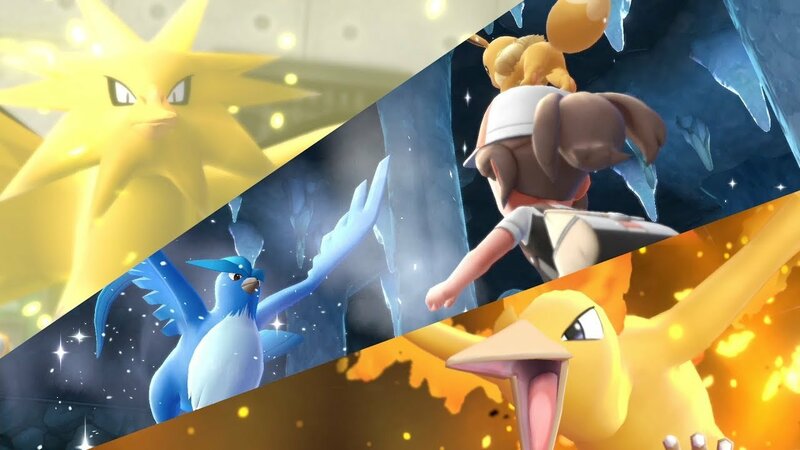 In the Kanto region, the Pokemon games will feature several different Legendary Pokemon, including Articuno, Zapdos, and Moltres, just like you remember! You'll have to capture them after some pretty "intense" battles, according to the newly-released info, and it won't be as simple as the other battles in the game tend to be. When you defeat the birds, however, you'll be able to take them with you throughout the games. The press release says "including" the bird Pokemon, so it's entirely possible there may be more. Next, a new Candy system will be introduced. Rare Candies typically leveled Pokemon up by one level when administered in the past. Now, different Candies have different effects, where some might increase speed or defense, or some might raise various other stats. You can earn them by completing games in the GO Park's Play Yard, taking Pokemon for walks via the Poke Ball Plus, and numerous other ways. Lastly, the Pokemon GO Park is where players can transport Pokemon they've introduced via Pokemon GO in the past. The entire complex is comprised of 20 different parks, with 50 different Pokemon able to remain in each one, much like the Box system on Bill's PC in the past. You need to find and catch Pokemon within a GO Park before taking them with them on their Pokemon adventure. There's no limit to the number of accounts from Pokemon GO that an be attached to a single save file, either. Once there are 25 of the same species in the complex, there's a mini game unlocked for players to earn Candies with. Alolan Pokemon will be supported as well. There's a ton of new, cool stuff coming to the Pokemon world, but we won't get to check it all out until the games finally launch as Switch exclusives on November 16. Better make some time to catch 'em all again!